Anyway, it's simple. Peel a number of garlic cloves - say 20-30. Put them in a small saucepan, and pour over olive oil until the cloves are just about covered. Heat gently and let simmer for about half an hour. Let the whole thing cool, and transfer to a clean glass jar. Keep in the fridge. Slice off the top of the unpeeled garlic head, exposing a bit of the cloves. Drizzle olive oil and lightly coat the garlic heads. Wrap in tinfoil and bake in oven for approximately 35-40 minutes, until garlic is all soft and sweet.the garlic can then be squeezed out of the skins and spread on bread. This is a great use for leftover garlic, and a way to extend it's life. I grow my own, so I always have too much. This is a great way to hold on to it and save my extra - thanks for the tip! May I know what can i use this garlic for? Lola - thank you, baking it like that is great indeed! Karlsfoodie - well, anything really! But for a place to start, try the next recipe, for Chicken Risotto. That's very nice. What a wonderful simple idea. Going try this myself! 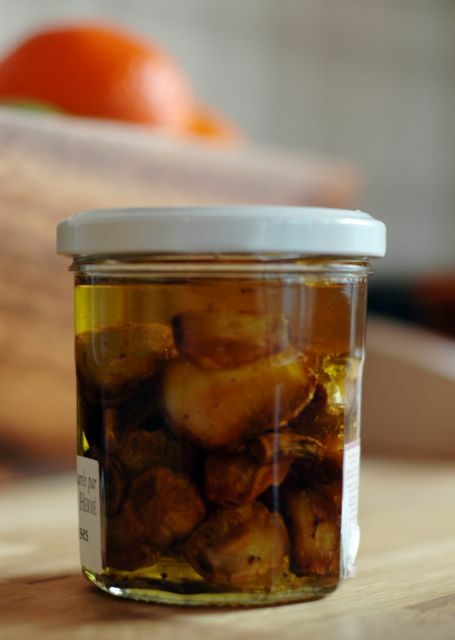 just one remark on your recipe; garlic confit does not keep well at all! It should be thrown out after a couple of days in the fridge as it lends itself to forming bacteria that cause botulism. Other than that, good stuff indeed! garlic confit baked in an oven at 120degC for 2 hours will not harbour any harmful bacteria, at that temp it would be sterilised. Store in a sterilised, airtight jar and it will keep for 3 mths in a fridge quite safely. You can also make a great chilli confit, both can be drizzled over pizzas and plain pasta for delicious authentic Italian dishes.